I know, I know, AWOL again. I do really well when I get on a roll, and then I get off that roll and start rolling on something else. Yeah, I know… sad, huh. Well, anyways! 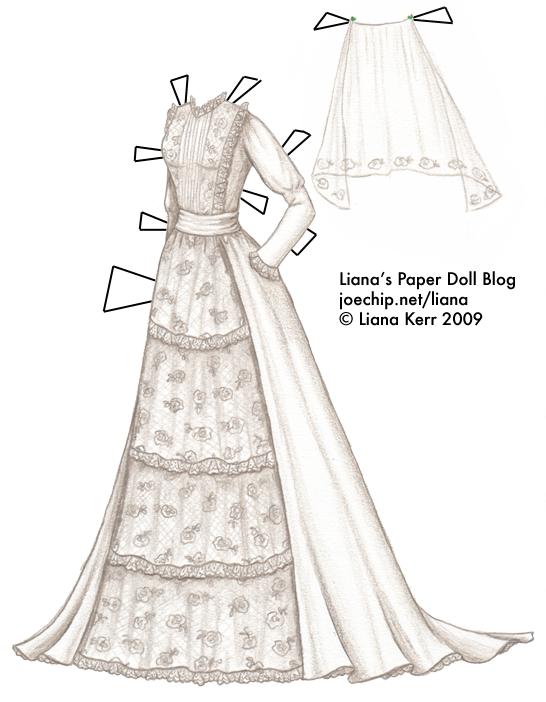 This gown is vaguely based on a couple of images of 1885 evening gowns that I have. 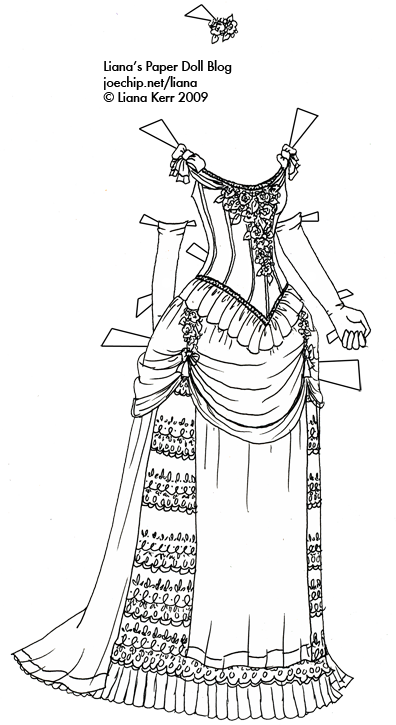 I really like late 1800s evening gowns, although I’m really a big fan of the gowns of the 1800s in general… Although I don’t think the skirt is draped quite right I do think it turned out cute, and it sure is fussy, so here I put it up for hours of coloring fun, possibly even days if you really bother with every little rose and bit of lace. I really like coloring, and I will admit it is easier sometimes if I already have the outline done like with these – I don’t know how some of my kindred paperdoll blogging spirits can always work in black and white. I just sit here and pile up whatever Prismacolors I’m using, and I always sing to myself if I’m home alone, too. 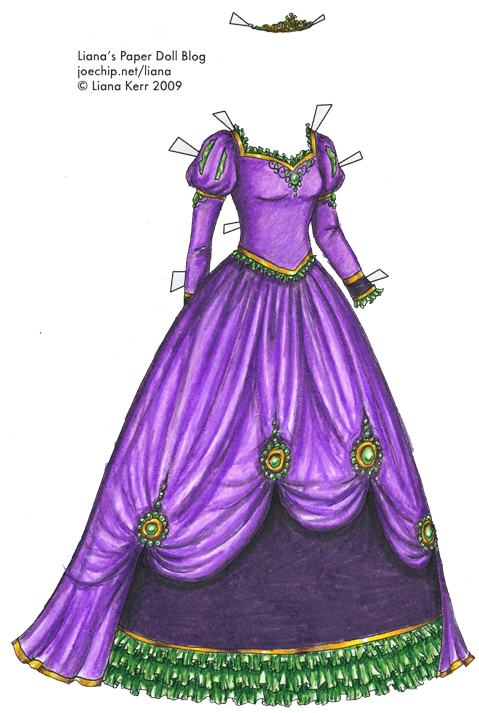 As for this gown, Melanie Ann who won my guess-the-number-of-colored-pencils contest wanted me to color it in purple and green, so here we have, well, lots of purple and green! (With a little gold, because I just had to have a highlight color…) I hope you like it, Melanie Ann. However, I will say, I don’t think one piece of fabric can actually drape like that skirt does, so please overlook all paperdoll-related warping of reality. I had fun coloring to someone’s specifications, so I wanted to do another contest. Here it is: Out of all my Prismacolors, which one is my favorite color?